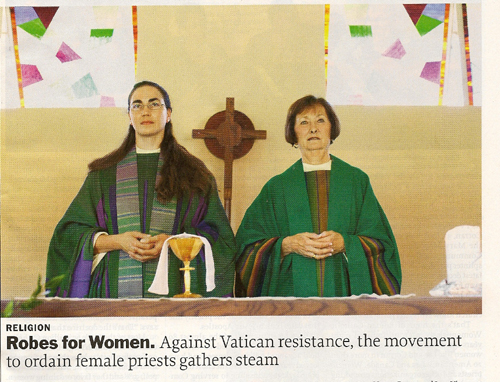 In the TIME MAGAZINE of today, 9/27/10, there is an enlightening article about the Roman Catholic Womenpriests, a group which includes our stellar KHS65 classmate Jane Via. They have received PR, good and bad, in the past in local newspapers around the country and on TV, but this is the first mainstream publication of which I am aware that is hitting the subject of the ordination of women in the Roman Catholic Church head on. The link above now gives the full text of the article since that issue is no longer on news-stands. Thanks a bunch to Lou Gossett for alerting me to this great press for our great friend Jane Via, another member of KHS65 making our group look good as we barrel through our lives! SAN DIEGO -- As a 5-year-old child of Presbyterian parents, Jane Via was deeply attracted to the 1950s Catholicism of her friends in her St. Louis neighborhood. That initial allure, however, was the start of a journey of faith that ultimately led her to a position of deep conflict with the authorities in the church she had grown to love. 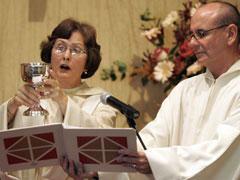 The 62-year-old Via converted to Catholicism as a young adult. Decades later, she was ordained, first as a deacon in a 2004 ceremony on a boat in the Danube River, and then as a priest in 2006 on another boat, this time in Lake Constance, which has a shoreline shared by Switzerland, Germany and Austria. Church authorities, of course, would say she is not ordained but rather self-excommunicated. She would reply otherwise, as she did in a July 19 interview here with NCR. While the situation reaches the “either/or” stage rather quickly in conversation, the reality is something more complex and considered. It is no little irony that the woman who now leads Mary Magdalene Apostle Catholic Community of 150 members (she makes her living, by the way, as a lawyer with the San Diego district attorney’s office) was smitten with the “concrete” reality of the Catholicism of her childhood. How did she get the inclination, at age 5, that she wanted to be Catholic? Her early fascination with Catholicism never went away. In a reversal of the usual go-to-college-and-leave-the-church routine, she went to Purdue University in West Lafayette, Ind., and became a Catholic. She didn’t tell her parents until she graduated and by then, she said, “I was 21, I was off to graduate school, I was leaving home.” Her parents weren’t happy, she said, but her father, “really the person of faith in our family,” wrote her a letter saying he honored her choice even if he wasn’t happy with it. Having earned an undergraduate degree in Spanish language and literature, she went off to Marquette University in Milwaukee for a five-year program for a doctorate in theology. But a turning point occurred before that, during her junior year of college, when she spent a semester in Spain studying theology with Jesuits and living in an Opus Dei household. While one can hardly expect Opus Dei to cheer the direction she’s taken, she said she found “many wonderful things about the structure of Opus Dei,” while simultaneously gaining new and progressive theological insights from the Jesuits who taught the theology courses at the college she attended. Following Marquette she got a teaching job at Mercy College in Detroit, at a point when she also decided she wanted to be a lawyer. But she couldn’t afford the tuition on her teaching salary. She taught there for three years before taking a job at the University of San Diego, a Catholic institution, teaching religious studies. One of the attractions that sealed the deal was when she learned that she could attend the university’s law school for free, and she did. She was becoming increasingly aware of women’s issues and recalled that at Marquette, at one point, she had been introduced to a group of people as “This is Jane Via. She’s the ornament in our department.” She said she was probably the youngest female in the department. In 1982, she earned her law degree and was married that same year to Philip J. Faker, a financial planner and investment advisor and “Jane’s biggest fan.” Faker has his own Catholic story. Via describes him as “a driven-away Catholic,” largely because of an incident of deep betrayal of one of his family members by a priest when he was a child.